Today is National Punctuation Day. It's an homage to the apostrophe, the bracket, the colon, comma, dash, ellipsis, exclamation point and all the other special marks we use to write sentences with. Be sure to use them properly today! 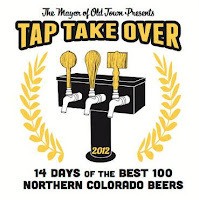 Here's what's happening around the Colorado beerosphere today Monday, September 24th, 2012. Rueben's Burger Bistro (Boulder) - Grats go out to Rueben's for being voted as the Best Beer Selection At A Restaurant as part of the Boulder Daily Camera's 2012 People's Choice Awards for Boulder County. They received the GOLD in this category. Rueben's has over 125 different beers available. To celebrate, Rueben's is offering a 1/2 off ANY Beer coupon on their Facebook page. Go Like them and save and print their coupon. Offer good through September 30th. Limit 1 coupon per person. Located in Boulder at the corner of Broadway & Walnut. Hall Brewing Company (Parker) - Their new building is up. The fermenters and bright tanks are in place, and now they are expecting their new 20 barrel brew system to be delivered in two weeks from today. Stay tuned Parker, it won't be long now until your new brewery will be up and in operation. Hall Brewing will be located at 8530 N. Vinegaroon Way. City Star Brewing (Berthoud) - The last one was so popular they're doing it again! 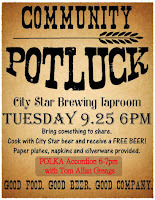 Tomorrow, September 25th at 6:00pm at the brewery, they're hosting another Community Potluck. Everyone is encouraged to bring a dish of food to share. And if you happen to create one of your dishes with a City Star beer as one of the ingredients you'll receive a FREE Beer! Paper plates, napkins and silverware will be provided. 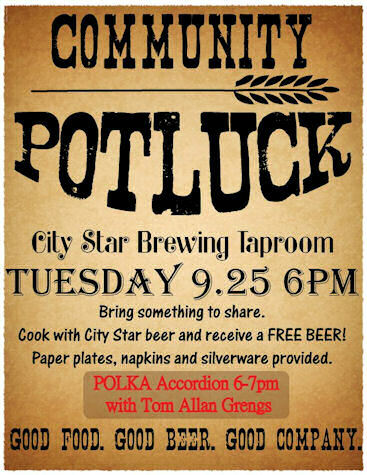 Listen to live polka music while you enjoy the potluck from 6-7pm. Good Food. Good Beer. Good Company. Located at: 321 Mountain Avenue in the heart of downtown Berthoud. Front Range BBQ (Colorado Springs) - FocusOnTheBeer.com is hosting another in a series of Meet The Brewer nights. This time it's at Front Range BBQ and joining in will be Eric Salazar from New Belgium. Come listen to Eric talk about beer and sample some of their special beers like: Biere de Mars, Eric's Ale, Fall Wild Ale, La Folie, Super IPA, and Trippel Firkin Dry Hopped. The event will be on Thursday, October 4th at 7pm. Front Range BBQ is located at: 2330 W. Colorado Ave, in Colorado Springs, CO. The Mayor of Old Town (Fort Collins) - The GABF is almost here and The Mayor is planning to hold a huge celebration. "Tap Into Northern Colorado" is being planned for October 1st - 14th, and with it there will be a complete tap takeover at The Mayor. All 100 taps will feature Northern Colorado beers exclusively to showcase the great tastes from the breweries in this area. Breweries include: New Belgium (up to 18 different Lips of Faith beers), Odell Brewing, Funkwerks, Equinox, Grimm Brothers, Avery, Upslope, Asher, Oskar Blues, Left Hand and Crabtree Brewing. There will be some rare cellar selections included along with some collaboration beers and some Pro-Am beers as well. Taps will keep rotating with new NoCo beers. There will also be buses picking up and dropping off people right outside who wish to tour the area breweries. This will become a big annual event! Keep your eyes on the Mayor's event Facebook page for additional details. Located at 632 S. Mason Street in Fort Collins, CO.
Black Bottle Brewery (Fort Collins) - Have you been blacklisted yet? Over half of their limited memberships (200 only) have been sold and there's still openings for several more members. Check out the special deal you get for signing up for membership at their website: www.bbbblacklisted.com. The brewery will be opening this Fall so get ready for great beer, drinks, food and more! Wit's End Brewing Co (Denver) - Wit's End is celebrating their 1 year anniversary this Saturday, September 29th, from 12-8pm! They will have Marco’s Coal Fired Pizza on hand and they plan to have their full line up of beer on tap, plus some new ones. Stop by and revisit Wit's End and see how they've grown in the last year. Located at: 2505 W. 2nd Ave, Unit 13 in Denver, CO.
Pagosa Brewing Company (Pagosa Springs) - A new brew has been created in honor of one of Colorado's newest National Monuments - Chimney Rock Archaeological Area in southwestern Colorado. Pagosa Brewing's Ancestral Ale was made with natural ingredients found in and around that area. Look for this beer where ever Pagosa Brewing beers are sold. 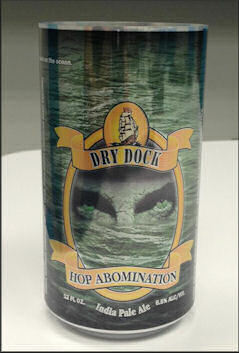 For more information, read today's Press Release on this beer. Crazy Mountain Brewing (Edwards) - Saturday September 29th is the Second Annual Brewski Bones Paws N' Pints: A Charity Walk Benefiting Search and Rescue Dogs of Vail Mountain Rescue. The event kicks off at 3pm with a 3mile walk around Edwards followed by a human/canine after party! A $20.00 entry fee gets you 2 pints of CMBC brew, BBQ and a bandanna for your pouch! Plentiful doggy snacks will be provided by Brewski Bones and there will be a silent auction with some incredible items. For more information or to register early, call the tasting room at (970) 926-3009. 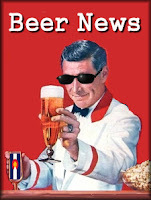 There's even more Colorado beer happenings and discussions on the Fermentedly Challenged Facebook page. Thanks for helping us grow to nearly 1100+ "Likes" so far in 2012!